Got word from my dealer today that they will be towing my Stinger GT to "a Kia dealer in Vineland NJ" per direction from the Kia rep for it's repaint sometime soon. He said this dealer has/is repainting several yellow stingers, mine is in the que. My google search shows this dealer to be RK Kia. Anyone know how good or bad they are or any other yellow Stinger owner have their car repainted there? I think you'll be fine. If you're unhappy with the repaint, KIA will allow you to trade it in for another. This is a correct part of the process. 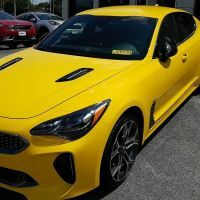 Once the repaint has been completed, the dealership will be in contact with their district service representative from Kia to come and inspect the vehicle so that they can determine that it meets their satisfaction. Once they approve of the repaint, the dealership will contact the customer for pickup. When the customer looks the car over and approves, they will sign warranty paperwork for authorization of the warranty work AS WELL AS a document stating that you accept the repaint and waive your right to have the car bought back or replaced. One thing to remember is this; accepting the vehicle and the repaint starts the process of you receiving the compensation check. Don't forget that Kia is paying you for the inconvenience that they know you're going to have to put up with.